Pycon: Educators meet Industry Professionals and unite! Teachers are doing a fabulous job at tackling the new curriculum and as we continue our learning journey we need to make use of communities around us who are willing to help. Programming is new to many teachers, but there are loads of people who do it all day (and then go to ‘coding parties’ at night for fun!) and we can use them to help us out! 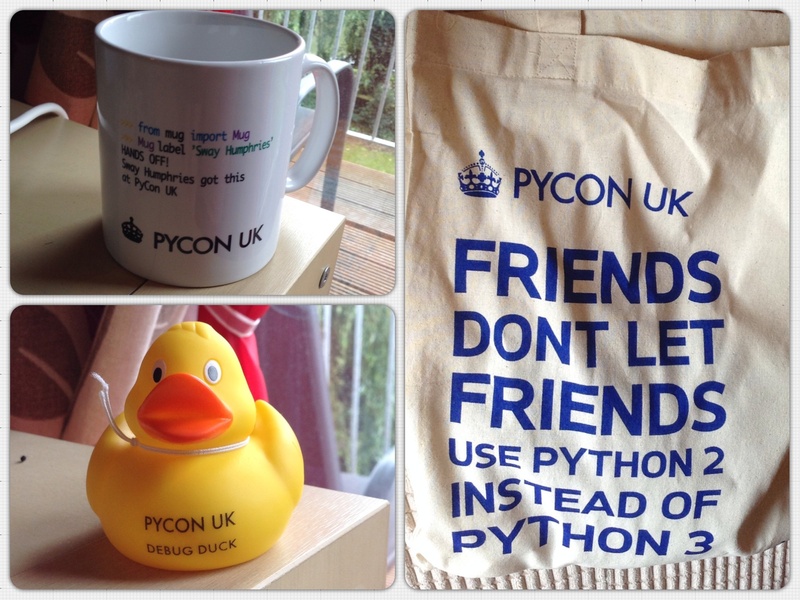 This weekend marks ‘Pycon’ a community-organised conference about the Python programming language. Before you all think ‘ahhh, that’s very scary and I wouldn’t know anything’ believe me, all you need is to be willing to learn! The Pycon organisers have a specific education track designed to support teachers with using Python in the classroom, but the really cool thing is the mix of developers and teachers – it’s like a pool of people who can tell you what you’re doing wrong or explain tricky things and make your resources to help you teach it: amazing! Pycon kicked off with breakfast, nom nom nom, definitely not a bad way to start! And I happened to bump into James who is a fellow Picademy graduate! This kicked things off well and I joined his table chatting about various things and socialising before the opening talk. Meanwhile the Raspberry Pi team were setting up in the classrooms so you know it’s going to be good! The opening talk included both the education track and the ‘normal’ track at Pycon which was nice as a general overview. Apparently they are expecting 471 attendees in total including around 70 children! Teachers got apples thrown at them, all in good humour of course! Nicholas Tollervey (@ntoll) introduced and explained the Education Track and Pycon. He is responsible for making the really cool things happen for teachers and children! The attendees were also shown a little bit into the world of teaching! Then we all got very excited about robots! Now we separated into the Education track and ‘main’ track and began our lessons for the day. The first was whether or not we were a beginner which raise some interesting questions! Having spent a lot of time with good programmers, I know I am an absolute beginner, however, this very much depends on who you are comparing yourself to! He told us that if we could guess at 3 things that would be wrong with that code that we weren’t a beginner and therefore should try the trickier stuff! We then used our experience of watching Cows and fields to try and recreate parrots which had catchphrases. Lucky we had some really helpful developers on hand to help us our. The guy (whose name I don’t know – sorry) was great at asking us what we were doing and getting us to explain why we were doing stuff – it was like a complete role reversal from when I’m teaching and I question my students! Next we moved on to ‘Pythonic Minecraft’ and exploring different things you can do when you use Minecraft on the Pi controlled in Python. Martin O’Hanlon (@martinohanlon) led the session and his co-written a book all about ‘Adventures in Minecraft‘ if you’re interested. This was great because the introduction showed us the scope for creation in Minecraft, everything from making your house follow you around, to making a bridge build itself before your very eyes, to making your house a windmill with rotating blades…epic amounts of possibilities. and then make it so the code appeared when you were falling out of the sky…’Don’t look down’ it was very apt…Next, we had a go at generating blocks above our heads and were even challenged to create traffic lights with blocks of coloured wool. All of this was totally achievable to a group of people who didn’t know much about Python just an hour before – epic! These guys are based in Python but have a flowchart-style display which also can be used to control them. They are very engaging but also expensive! The afternoon session was breakout time to explore resources and schemes of work that you wanted help developing. Here was the real time that developers and educators could get together and be like ‘I need to do this but don’t know how…’ or ‘Can you make an example of this?’ or ‘I want a child-friendly version of this…’ This is a great opportunity. To end the day, we shared what we’d done – pointed people towards resources that might be useful and will eventually have the things which have been created centralised so that we can all access them!